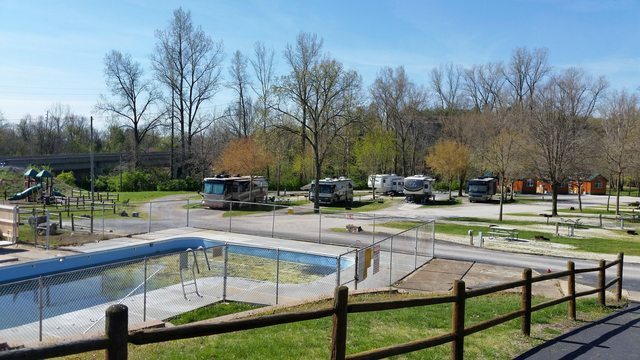 We've stayed at Cahokia RV Park a couple times. It's nothing special, but we were there to see the sights not the campground. Very convenient to St. Louis. I don't think they are open. And will not take reservations until spring (as of last year). The Casino hotel does the reservations. You can see the subway stand from park. So walking is not a problem. We stayed at the Casino Queen RV Park a few years ago. Very expensive for what it is- parking lot with gravel between the spots. But, the office can ring up a shuttle to take you over to the metro/subway/train station; that was nice. It was great for exploring the city- you were right there. We later stayed at 370 Lake Side park and liked it much more as a campground/RV park. Spacious sites and cheaper rates. But, further from the city. Though, my wife and kids did go into City Museum and enjoyed that. We stayed at the St. Louis West KOA about a year and a half ago. It is a bit of a drive to St. Louis proper, and is pretty much a standard KOA. One thing we encountered was a power issue - our Progressive EMS kept kicking off due to low voltage. The park maintenance acknowledged they have an issue and were able to move us to another site, but if we hadn't had the EMS, we wouldn't have known of the problem (and potential risk to the air conditioner). Don't know. Wife drove into the city.